Gregg Araki’s latest feature is supposedly a return to his roots, a manic, campy dark comedy in the vein of his earliest works, such as The Doom Generation (1995) and Nowhere (1997). I have seen neither of those films and can only compare the new one, Kaboom, to Araki’s last two features, the beautifully sad Mysterious Skin (2004) and the underrated stoner comedy Smiley Face (2007). 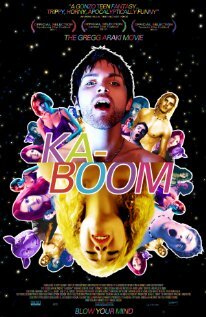 I am rather unhappy to report that Kaboom is nowhere near as great a film as Mysterious Skin and, to me at least, nowhere near as fun as Smiley Face.